1.Heat large covered saucepot filled with salted water to boiling over high heat. Add asparagus and cook 4 to 5 minutes or just until asparagus is tender; drain. 2.In same saucepot, melt butter over medium heat. Add almonds and cook 2 to 3 minutes or until almonds turn golden, stirring occasionally. Stir in juices, salt and pepper. Add asparagus and toss to combine; cook 1 minute. 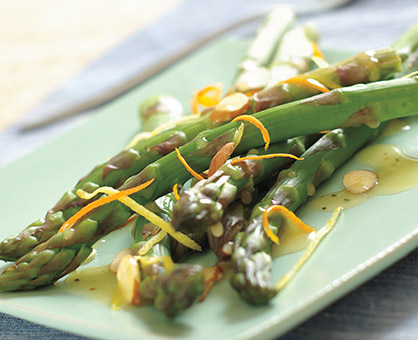 Serve asparagus garnished with zest.